Children at Hollins Grundy use the Internet on a regular basis as part of their learning. In school, we have regular ‘e-safety’ activities to remind children of the importance of keeping themselves safe online. Do you know what your child is doing on a laptop computer, mobile phone, iPod etc when alone? At school we teach children about Internet safety. Social networking allows many us to keep in contact with people and to share details and photos of what is happening in our lives. Young people will have grown up surrounded by sites such as Facebook, Instagram, and Myspace. Many of these sites have a minimum age limit of 13, so our pupils should NOT be using them. However, social networking sites will undoubtedly play an important part in the lives of youngsters as they get older and we need to ensure that we give them simple guidance to ensure that they use them safely. 1. Adjust privacy settings-In Facebook you can select Settings — Privacy Settings — Profile. This will allow you to restrict who sees information and prevents friends of friends seeing your posts and photos. In Bebo you can do a similar task by selecting Settings — Privacy Settings. Remember that you can also restrict who sees each photo. 2. Think before you post. It is very easy to a post a comment or photo in anger or frustration. By the time you remove it many people will have seen it and the harm has been done. 3. Only add people who you know in real life as friends. Remember that just because someone has a photo showing them as school pupil in their profile doesn’t mean they are – they may actually be someone completely different. 4. Think carefully about how much personal information you put on your profile – you don’t need to tell everyone your address, date of birth and mobile number. 1. Set up an account for each user on your pc at home and only give yourself administrator access. This will allow you to keep control of the settings and the installation of software. Each user account you can be password protected. 2. Add a screensaver protected by a password to your account so that if you leave your PC for 5 minutes you will have to enter your password. You can do this in the Control Panel. 3. Encourage your family to use technology in a public part of the house and not in a bedroom. This applies not just to PCs but also to laptops, game consoles, internet browsers on phones etc. 4. Remember that many consoles come with family settings. For example if you want to disable or limit Xbox Live on an Xbox you can do so by going to Settings — Parental Controls. 5. Encourage your child not to open e-mails from unfamiliar e-mail addresses and to avoid opening suspicious attachments. Remind your child that if an e-mail seems too good to be true then there is almost certainly a catch! 7. Ensure that you have a pop-up blocker turned on. Both Internet Explorer and Firefox come with their own pop-up blockers. If you are accessing a site that has a genuine pop up window that you need to access you should add it to the trusted sites rather than turn off the pop up blocker. The settings can be found in the Tools menu of the browser. We know how demanding it can be to find the time when you’re a busy parent, and also just how daunting it can be to try and work out if the information you’ve found online is up-to-date. That’s why we were so pleased when Internet Matters launched earlier this year. 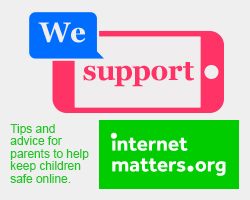 InternetMatters.org is a portal dedicated to making sure all parents are only a click away from advice, tips and support about online safety for children. The information is divided into age-appropriate sections to help you talk to your child about the issues and technologies they’ll come across as they grow up online. From setting your parental controls to teaching your child how to be a good friend online, you’ll find a wealth of information so that you can spend less time researching and more time having fun with your family. Vodafone have produced a Digital Parenting Magazine which informs parents about the various technologies children are accessing today. There is information on Facebook settings, Xbox settings, Blackberry controls, jargon busting and many more ‘How to Guides’. Well worth a read! Kidsmart gives lots of advice on how to stay safe online.